The Mehli Mehta Music Foundation presents its annual choral concert with over 220 students from the Foundation’s Singing Tree choirs, the Udayachal High School, Aseema schools and the St. Stephen’s School. Choral Director, Mariona Fernández Blanco from the Palau de la Música Catalana in Barcelona returns to Mumbai to train young choristers between the ages of 6 and 16. The choristers will sing in various languages revolving around the theme ‘Building Bridges’ across cultures and communities. Tickets: Rs. 750 + GST and Rs. 550 + GST will be available on BookMyShow from August 12, 2018 or at the NCPA Box Office from August 12 onwards . Tickets: Rs. 700 + GST and Rs. 600 + GST will be available at the NCPA Box Office or Bookmyshow from October 12, 2018. Internationally acclaimed Lithuania pianist Kasparas Uinskas began his studies at the age of six at the Academy of Music in Lithuania. He continued his studies at Warsaw and then the Juilliard School as a recipient of the Vladimir Horowitz scholarship. Praised by critics for his virtuosity and romantic style, he has performed at the world’s most prestigious concert halls and is a frequent guest at many international music festivals throughout Europe and the USA. His repertoire includes works by a wide range of composers from Bach to the 20th century. However, composers of the romantic era dominate a significant part of his repertoire. Tickets: Rs. 500 & Rs. 300 will be available at the NCPA Box Office or Bookmyshow from January 12, 2019. 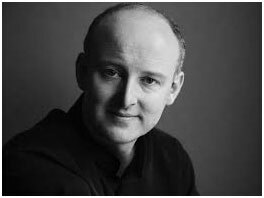 James Lisney made his Wigmore Hall debut in 1986 and early representation by the Young Concert Artists Trust in London led to a career that has taken him to many prestigious venues and gained invitations to appear with major orchestras. James Lisney`s repertoire ranges from baroque masterpieces to music of the present day. In the past decade, the music of Schubert and Beethoven have been a central pre-occupation (in performance and in recordings) and he regularly presents cycles of the piano sonatas and relevant chamber music. His recordings (on Naxos, Bis, Somm, Olympia and Carlton) have gained the highest recommendations. His present season sees him performing Schubert cycles in the Oxford International Piano Series, the Leipzig Gewandhaus and Mumbai in 2018 and 2019. Please call Jennie or Lovey on +91 22 2382 3644, +91 22 2380 1379 to register the number of seats required. Kun Woo Paik, the legendary Korean pianist and pupil of Rosina Lhévinne, Illona Kabos and Wilhelm Kempff has played recitals in every major concert hall in the world and has performed as soloist with leading international Orchestras. He is a regular guest artist at most major music festivals and is a prolific recording artist. Henri Demarquette the eminent French cellist, and student of Pierre Fournier, Paul Tortelier and Janos Starker has had a brilliant career performing with international orchestras worldwide, and is actively engaged as soloist and chamber musician. Dan Zhu is widely recognised as one of the leading violinists of his generation on the international stage today. He has performed recitals and played concertos with world renowned orchestras in North America, Europe and Asia. 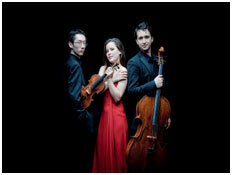 The Amatis Trio was founded in Amsterdam and has emerged as one of the leading piano trios among the new generation. 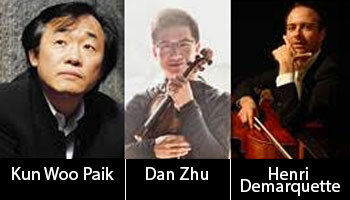 It was founded in 2014 by German violinist Lea Hausmann, British Cellist Sameul Shepherd and Dutch pianist Mengjie Han. The young, international trio has received enthusiastic responses from audiences and critics across the UK, Europe and Asia after winning several international competitions and prizes. The coming season will see them perform at the Wigmore Hall, Concertgebouw Amsterdam, the Salzburg Festival and concert engagements in China, Australia and North America. Programme will include works by Haydn, Shostakovich and Mendelssohn.